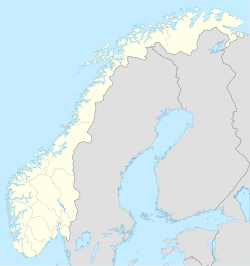 Stavanger (Norse pronunciation: [stɑˈʋɑŋjær] ( listen)) is a ceety an municipality in the coonty o Rogaland, Norawa. Stavanger municipality haes a population o 121,610, but there are 189,828 fowk livin in the Stavanger conurbation, makin Stavanger the de facto third lairgest ceety in Norawa. Stavanger is an aa the centre o the Stavanger metropolitan aurie which haes a population o 297,569, an the admeenistrative centre o Rogaland coonty. The ceety is commonly referred tae as the Petroleum Caipital o Norawa. The ceety, despite its age, anerlie grew tae become amang the maist influential an important Norse ceeties in the seicont hauf o the 20t century, efter oil wis discovered in the North Sea. Today there are significant foreign influences as a result o several major internaitional oil companies' presence in the ceety. Several ither foreign influences can be foond, an among the mair prominent is the NATO Joint Warfare Centre. Norawa's auldest cathedral, Stavanger domkirke, is situatit in the ceety centre, richt next tae lake Breiavatnet. The twa maist popular recreational auries in Stavanger are situatit aroond lakes, namely Mosvatnet an Stokkavatnet. ↑ "Twinning". Aberdeen City Council. Retrieved 2008-03-02. ↑ "Prefeito recebe comitiva da Noruega interessada em investir em Macaé". Retrieved 2012-09-14. ↑ "Netanya - Twin Cities". Netanya Municipality. Archived frae the oreeginal on 2013-02-01. Retrieved 2013-08-01. Wikimedia Commons haes media relatit tae Stavanger.